You smell like an original recipe kind of gal. As if it’s not hard enough to be a teenager dressed to the nines in a formal outfit that probably cost too much and won’t change your life in the way you’ve always dreamed of, in a room filled with other teenagers awkwardly swaying/pawing at each other, why not strap fried chicken to your arm and just call it a night? To wit: KFC is peddling customizable chicken drumstick corsages for those discerning promgoers looking to go that extra weird mile. If you’re sniffing the distinct scent of publicity stunt, we’re with you: There are only 100 available, and you’ll have to bring a coupon in to get your own chicken when the time is right. Looking for a corsage that will make your date’s eyes light up and her mouth water? 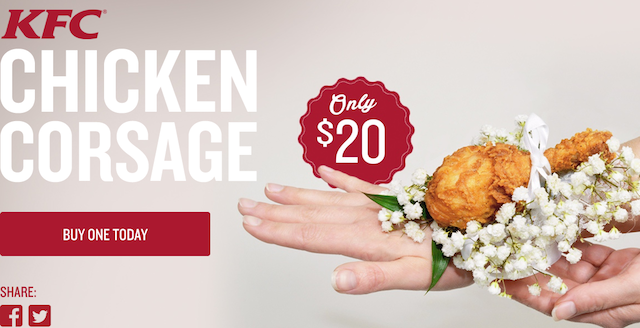 This KFC drumstick corsage is the Secret Recipe to making sure this year’s dance will be one you both remember. Don’t delay. Order today! Only a limited edition of 100 chicken corsages are available. Just like the last piece of chicken in the bucket, when they’re gone, they’re gone. If you happen to attend a prom that doesn’t come with dinner included in the price of the ticket, this is actually a pretty economical choice. You can gnosh while you wait for your mother to take the 19,003rd photo of you and some guy whose tuxedo was way too big and whose name you won’t remember 14 years later anyway so whatever, just hurry up.